A Truly ‘Cradle to Grave’ Building Envelope Solutions Service. MRC Group with 4 strategically located regional offices provides Excellence in Total Building Envelope Solutions throughout the whole of Southern Africa. We pride ourselves in continually leading the way in installing & maintaining the highest quality service & systems in Africa, measuring ourselves against international standards. We undertake works in the Commercial, Industrial, Retail, Governmental, Education, Defence, Transportation and Mining market sectors. 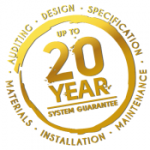 A Truly ‘Cradle to Grave’ Building Envelope Solutions service means we partner with you for up to 20 years designing delivering, installing and maintaining your Building Envelope Solutions for the life of the Warranty. Complete range of revolutionary Metal Roofing & Cladding Systems for the New Build & Refurbishment market sectors. Metal Over-Roofing of existing asbestos or metal roof systems WITHOUT removing the existing roof. New Building twin skin Metal built up systems providing the highest Thermally Efficient metal solutions with R-Values of up to 10 (m2.K/W) achievable. High Security systems provide solutions for security sensitive roofs and walls. Flat to Pitch roof conversions provide a lightweight steel support system for failed flat roofs. Green Roof & Living Wall systems compliment both our Metal Roofing & Cladding and Waterproofing divisions. Rainwater Harvesting systems are designed and installed with our Metal Roofing & Waterproofing divisions to maximize the savings in water. Permeable stabilized surfaces that can be used for the movement and parking of vehicles (automobiles, trucks, construction equipment, aircraft, etc.) designed to infiltrate storm water runoff instead of shedding it off the surface. Derbigum Torch-On Waterproofing Roof Membrane Systems. Synthetic Single-Ply Waterproofing Membrane Solutions. Penetrative SCP Concrete Waterproofing Systems. Green Roof Systems complete with Waterproofing Systems. Over 100 different coatings to suit the application, environment and design requirements to extend the life of existing materials and systems. Coatings can be applied on-site electrostatically to ensure the high quality application even on-site. External & Internal Fire Resistant Wall Systems with up to 4 hour fire rating. Metal Built up, Composite Panels & Dry Walls Solutions to suit the application, height and environment. Applications include Secure Data Centres, Cold Store and Industrial Partition Walls. Vast experience in the largest range of Building Envelope Solutions enables us to provide a full maintenance service for your Building. Cleaning & maintaining your roofs, gutters, cladding, rainscreens, fences, pipework, green roofs and living walls and external plant / renewable energy systems. Identifying and securing leaks long before they ever happen and before they cause lasting damage to the building / structure. Ensuring your material system warranty – WITHOUT maintaining your Building Envelope your material warranties are void. A Truly ‘Cradle to Grave’ Building Envelope Solutions service all backed with a Single Source, Transferrable Warrantee. Includes Design, Materials, Installation and Maintenance for up to 20 Years!